This is a vintage book that I picked up this summer at Goodwill. It has really fun illustrations and beautiful ornaments. When you check out the Carbon FX review you will see that the creator of the auto trading software focuses on few essential things that every trade plan should have. The trade plan should be written in a very clear and concise way and should be absolutely to the point. This leaves no place for biasedness or any guess work. It is important that one does not deviate from the trade plan and follows each step judiciously. The trade plan should clearly state which market will the trader trade in and also whether he will be investing his capital into one market only or in multiple markets. 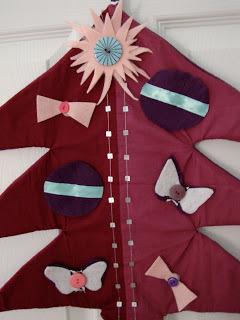 I saw the most beautiful handmade felt Christmas tree on Ruffles and Stuff the other day. The moment I saw it, I knew I had to make one for Juliet. It’s the kind of thing she would LOVE. So, I studied hers and then rummaged through my fabric box to see what I could find. I managed to piece together a smaller tree using an old curtain and some purple flannel left over from another project.I cut out the tree shape and sewed it together with a piece of batting in between. 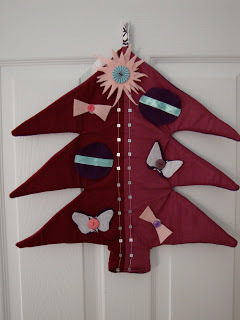 I made the ornaments out of felt and sewed ribbon and buttons to embellish them. I attached velcro to the backs and to the front of the tree so Juliet could move the ornaments around as she wished. Here’s a close up of the star. It’s two pieces of felt–I tried to make a starburst and messed up twice, so I just layered them to make the mistakes less noticeable and then sewed the large button in the middle. Juliet loves it! She carried it around all evening and currently has it in her bed with her. Usually, it lives on her bedroom door. I’m linking this post up with ABC and 123 Learning’s Handmade Gift Ideas and Tip Junkie’s Talk to Me Tuesday’s Best of 2009!